The Digimon Reference Book profile for November 13th, 2015, is Dinotigermon. A translation is provided below; you may use it freely on forums, wikis, etc. so long as you link back to or cite back to this page. Profile: Wounded Digimon become its prey. An ancient beast Digimon which was the sole Saber Leomon to survive the cyclic law of the jungle's unending battle, by taking in the earth's metal components so that its whole body underwent extreme ossification. 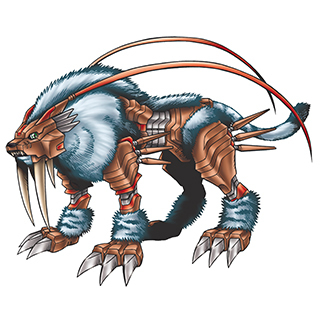 Although its movements are slower compared to Saber Leomon's, it has physical strength and toughness nearly double that of the original, massive swordlike fangs, and thickly armored skin, all with which it forcefully kills Digimon. With such valor, Dinotigermon has a wild predation instinct that other Digimon fear, so they never come near to it. Its special attacks are "Ground Fang," pinning down the enemy to thrust and whet its fangs on them, and "Highland Fang" swinging down at them with its fangs from a high altitude and instantly tearing them to pieces. A very small minority of Saber Leomon survived the cyclic law of the jungle by taking in the earth's metal components so that their whole bodies underwent extreme ossification. Special Move: "Ground Fang," pinning down the enemy, and thrusting and whetting its fangs on them. The Digimon Reference Book is Bandai's official bible on the various Digimon species, first launched in 2007 and now comprising over seven hundred different Digimon out of the thousand-plus species that exist. It updates weekly with new Digimon profiles. Last week's profile was Karatsuki Numemon.